ROUND ROCK, Texas, July 2, 2018 /PRNewswire/ -- The Special Committee of the Board of Directors of Dell Technologies ("Dell") representing the holders of Dell's Class V Common Stock (NYSE: DVMT) today disclosed details of its comprehensive process to protect and maximize value for the holders of Class V Common Stock in a negotiated conversion of the Class V Common Stock into shares of Dell's Class C Common Stock with a cash election option. Under the terms of the transaction, shares of Dell's Class V Common Stock will be converted into the right to receive a fixed number of shares of Dell Class C Common Stock at an exchange ratio of 1.3665 shares of Class C Common Stock for every share of Class V Common Stock. Based on an implied value of $109 per share of Class V, this would represent an equity value for Dell's DHI group of $48.4 billion and total consideration to holders of Class V shares of $21.7 billion. Alternatively, holders of Class V shares can elect to receive $109 per share in cash in an aggregate amount not to exceed $9 billion. Based on an implied value of $109 per share of Class V, the transaction represents a premium of 29 percent to the Class V Common Stock price as of June 29, 2018, the last trading day before the transaction was announced. Following close, Class V stockholders will own 20.8 percent of Dell if $9 billion in cash consideration is elected or 31 percent of Dell based on all-stock consideration, reflecting a pro forma equity value of $61.1-$70.1 billion for Dell Technologies based on an implied value of $109 per Class V share. Following the completion of the transaction, the Class C Common Stock will be listed on the NYSE, and Dell's governance will conform to the post-IPO governance structure provided by the Dell certificate of incorporation and other governance documents. The transaction remains subject to approval by a majority of the unaffiliated holders of the Class V Common Stock and is expected to close in the fourth quarter of calendar year 2018. The Special Committee said, "Over the last five months, with the assistance of our independent financial and legal advisors, we have conducted a thorough evaluation of a number of alternatives to maximize stockholder value. Throughout the process, we had ongoing discussions and negotiations with Dell Technologies regarding the transaction structure and key value parameters. Following this comprehensive evaluation, we determined that the transaction announced today is the best way to maximize value for all Class V stockholders. The implied value of $109 per Class V share provides Class V stockholders with a significant and immediate premium as well as the ability to participate in the future upside of Dell Technologies. Further, the option for stockholders to elect up to $9 billion in cash (nearly half of the implied transaction value) provides stockholders the ability to, in whole or in part, obtain certainty on the value received for their shares." On February 2, 2018, the Dell Board of Directors delegated authority to its independent and disinterested directors with the mandate to act solely in the interests of the holders of Class V Common Stock with respect to Dell's evaluation of potential business opportunities, including various alternatives Dell considered relating to VMware (NYSE: VMW). Dell holds an 81 percent economic interest and a 97 percent voting interest in VMware, and the Class V Common Stock was created to "track" a portion of this interest. The highly-qualified, independent and disinterested directors have been acting through a Special Committee, empowered to act solely in the interests of the holders of Class V Common Stock with respect to any business opportunity that would require that the Class V Common Stock be modified, converted or exchanged other than pursuant to the existing terms of Dell's certificate of incorporation. Further, any such change or action was irrevocably conditioned on both the unanimous approval of the Special Committee and the affirmative vote of a majority of the outstanding shares of Class V Common Stock held by unaffiliated stockholders. The Special Committee is composed of David Dorman, former Chairman and CEO of AT&T and Founding Partner of Centerview Capital Technology, and William Green, former Chairman and CEO of Accenture plc. Sought independent analysis on key aspects of the strategy and model underlying Dell's financial projections from an independent industry expert, DISCERN Analytics. The Special Committee has recommended that the Dell Board of Directors approve the transaction. After receipt of this recommendation, the Dell Board of Directors unanimously determined that the transaction is in the best interest of Dell and its stockholders and recommends that stockholders approve the conversion. Evercore is serving as financial advisor to the Special Committee representing the Class V common stockholders of Dell, and Latham & Watkins LLP is serving as legal counsel. 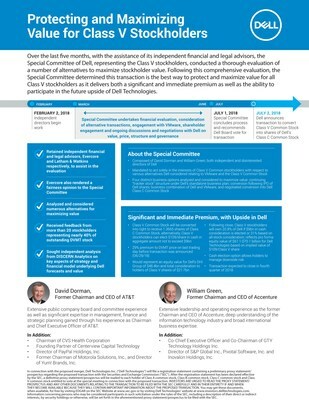 Details of the comprehensive evaluation conducted by the Special Committee are included in an infographic, which is posted on the Investor Relations section of Dell's website. The Dell press release, which was issued separately today, can also be found on the Investor Relations section of Dell's website. Dell Technologies issued a number of shares of Class V common stock at the closing of the Dell-EMC merger. Such shares of Class V common stock currently have an approximately one-to-one relationship with approximately 61 percent of the shares of VMware common stock owned by Dell Technologies. There are approximately 199 million publicly traded shares of Class V common stock outstanding. Dell Technologies' results or events in future periods could differ materially from those expressed or implied by these forward-looking statements because of risks, uncertainties, and other factors that include, but are not limited to, the following: the failure to consummate or delay in consummating the proposed transaction, including the failure to obtain the requisite stockholder approvals or the failure of VMware to pay the special dividend or any inability of Dell Technologies to pay the cash consideration to Class V holders, the risk as to the trading price of Class C common stock to be issued by Dell Technologies in the proposed transaction relative to the trading price of shares of Class V common stock and VMware common stock; competitive pressures; Dell Technologies' reliance on third-party suppliers for products and components including reliance on single-source or limited-source suppliers; Dell Technologies' ability to achieve favorable pricing from its vendors; adverse global economic conditions and instability in financial markets; Dell Technologies' execution of its growth, business and acquisition strategies; the success of Dell Technologies' cost efficiency measures; Dell Technologies' ability to manage solutions and products and services transitions in an effective manner; Dell Technologies' ability to deliver high-quality products and services; Dell Technologies' foreign operations and ability to generate substantial non-U.S.net revenue; Dell Technologies' product, customer, and geographic sales mix, and seasonal sales trends; the performance of Dell Technologies' sales channel partners; access to the capital markets by Dell Technologies or its customers; weak economic conditions and additional regulation; counterparty default risks; the loss by Dell Technologies of any services contracts with its customers, including government contracts, and its ability to perform such contracts at its estimated costs; Dell Technologies' ability to develop and protect its proprietary intellectual property or obtain licenses to intellectual property developed by others on commercially reasonable and competitive terms; infrastructure disruptions, cyberattacks, or other data security breaches; Dell Technologies' ability to hedge effectively its exposure to fluctuations in foreign currency exchange rates and interest rates; expiration of tax holidays or favorable tax rate structures, or unfavorable outcomes in tax audits and other tax compliance matters; impairment of portfolio investments; unfavorable results of legal proceedings; increased costs and additional regulations and requirements as a result of Dell Technologies operation as a public company; Dell Technologies' ability to develop and maintain effective internal control over financial reporting; compliance requirements of changing environmental and safety laws; the effect of armed hostilities, terrorism, natural disasters, and public health issues; Dell Technologies' substantial level of indebtedness; the impact of the financial performance of VMware; and the market volatility of Dell Technologies' pension plan assets. This list of risks, uncertainties, and other factors is not complete. Dell Technologies discusses some of these matters more fully, as well as certain risk factors that could affect the Dell Technologies' business, financial condition, results of operations, and prospects, in its reports filed with the Securities and Exchange Commission, including Dell Technologies' Annual Report on Form 10-K for the fiscal year ended February 2, 2018, quarterly reports on Form 10-Q, and current reports on Form 8-K. These filings are available for review through the Securities and Exchange Commission's website at www.sec.gov. Any or all forward-looking statements Dell Technologies makes may turn out to be wrong and can be affected by inaccurate assumptions Dell Technologies might make or by known or unknown risks, uncertainties and other factors, including those identified in this press release. Accordingly, you should not place undue reliance on the forward-looking statements made in this press release, which speak only as of its date. Dell Technologies does not undertake to update, and expressly disclaims any duty to update, its forward-looking statements, whether as a result of circumstances or events that arise after the date. This communication is being made in respect of the proposed merger of a wholly-owned subsidiary of Dell Technologies with and into Dell Technologies, with Dell Technologies as the surviving entity, pursuant to which each share of Class V common stock of Dell Technologies will, at the election of the holder, convert into the right to receive shares of Class C common stock of Dell Technologies or cash, without interest, and each existing share of Class A common stock, Class B common stock and Class C common stock of Dell Technologies will be unaffected by the merger and remain outstanding. The proposed transaction requires the approval of a majority of the aggregate voting power of the outstanding shares of Class A common stock, Class B common stock, Class V common stock other than those held by affiliates of Dell Technologies, in each case, voting as a separate class, and all outstanding shares of common stock of Dell Technologies, voting together as a single class, and will be submitted to stockholders for their consideration. Dell Technologies will file a registration statement containing a preliminary proxy statement/prospectus regarding the proposed transaction with the Securities and Exchange Commission ("SEC"). After the registration statement has been declared effective by the SEC, a definitive proxy statement/prospectus will be mailed to each holder of Class A common stock, Class B common stock, Class C common stock and Class V common stock entitled to vote at the special meeting in connection with the proposed transaction. INVESTORS ARE URGED TO READ THE PROXY STATEMENT/PROSPECTUS AND ANY OTHER DOCUMENTS RELATING TO THE TRANSACTION TO BE FILED WITH THE SEC CAREFULLY AND IN THEIR ENTIRETY IF AND WHEN THEY BECOME AVAILABLE BECAUSE THEY WILL CONTAIN IMPORTANT INFORMATION ABOUT THE PROPOSED TRANSACTION. You may get these documents, when available, for free by visiting EDGAR on the SEC Website at www.sec.gov or by visiting Dell Technologies' website at www.investors.delltechnologies.com. Dell Technologies and its directors, executive officers and other members of its management and employees may be deemed to be participants in the solicitation of proxies from its stockholders in favor of the proposed merger and the other transactions contemplated by the merger agreement, including the exchange of shares of Class V common stock of Dell Technologies for shares of Class C common stock of Dell Technologies or cash. Information regarding Dell Technologies' directors and executive officers is contained in Dell Technologies' proxy statement for its 2018 annual meeting of stockholders, which was filed with the SEC on May 15, 2018. Additional information concerning persons who may be considered participants in such solicitation under the rules of the SEC, including a description of their direct or indirect interests, by security holdings or otherwise, will be set forth in the aforementioned proxy statement/prospectus to be filed with the SEC.